There is an old saying that politics makes strange bedfellows. That will be very true this year as the various coalitions adjust to the economic problems that both the United States Congress and the Connecticut General Assembly have to deal with this year. The various special interest groups will continue many of their long standing alliances and also form new alliances to protect the gains they have made in recent years as the legislators try to balance a budget that will provide for essential public services in the face of lower income from all sources. Although our focus is not as narrow as some of the special interest groups, the Grange is very much a special interest group. The delegate body at our State Grange annual session each October passes resolutions to support certain programs and oppose others. Then the State Grange Legislative Committee works to carry forward those resolutions. At the same time there are many issues which come before the General Assembly where the Grange has never taken a position either way, so the Legislative Committee takes no action on them unless they will support or interfere with something we are taking a stand on. Often we work with other special interest groups that have similar, but not identical, interests to the Grange’s interests because we can all accomplish more by working as a group. 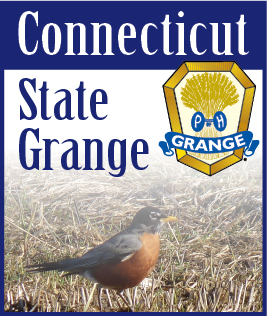 Some of the issues the Connecticut State Grange has taken a stand on are also issues in the other northeastern states and are also concerns to other organizations. Several years ago the northeastern Granges worked side by side with other groups to secure passage of the Northeast Dairy Compact. Now the Northeast Grange Agriculture and Legislative Group is trying to build a coalition with other agricultural organizations to work on our mutual concerns for the next decade. We are planning a meeting where representatives from the State Department of Agriculture, the Farm Bureau and the Northeast Organic Farmers Association (NOFA) will be invited to join with us to identify common concerns where we can work together to achieve our common goals. The Farm Bureau is being invited to represent the larger scale farm operations and NOFA is being invited to represent a cross-section of the smaller independent farmers. Depending on the results of our first meeting, scheduled for March 20, we may identify other groups that we will invite to join us. Our goal is to have a 20/20 vision of northeastern agriculture in 2020. At the national level, the National Grange Legislative Department is making plans for a legislative fly-in in Washington in May. The fly-in program operated for several years, but was dropped last year because the number of participants had become too large to effectively accomplish the program’s goals. The intensive 2009 program will be limited to 45 participants representing as many Grange states as possible. The first day of the program consists of workshops and speakers to update the participants on the National Grange’s position on many issues. The second day is spent on Capitol Hill with the participants meeting one-on-one or in very small groups with aides to their Senators and Representatives so they will realize the concerns of the Grange members in their home states and congressional districts. In some cases the participants will meet with their elected Senator or Representative, which is considered a significant achievement in the overall Grange legislative program. The National Grange Legislative Department is updating their “Blueprint for Rural America,” a paper which briefly presents the Grange’s position on various issues. At the recent Northeast Leaders Conference the legislative and agriculture directors from the seven State Granges were asked to review and comment on the proposed changes to the “Blueprint” for 2009.